I knew I couldn’t go to Portland without experiencing the bike scene firsthand, so I was thrilled when Matthew’s sister told us she would have bikes and a trailer for us. There would also be two extra adult helmets awaiting us, so, with Gabriel’s helmet in our checked bag, we were good to go. As anyone who bikes often knows, there’s no bike quite like YOUR bike. Matthew and I both missed our properly fitted bikes, nose-less saddles, and more upright riding positions. That said, bringing our own bikes on this trip really wasn’t feasible, so having two nice bikes, outfitted with locks and lights, no less, at our disposal for the week was quite nice. 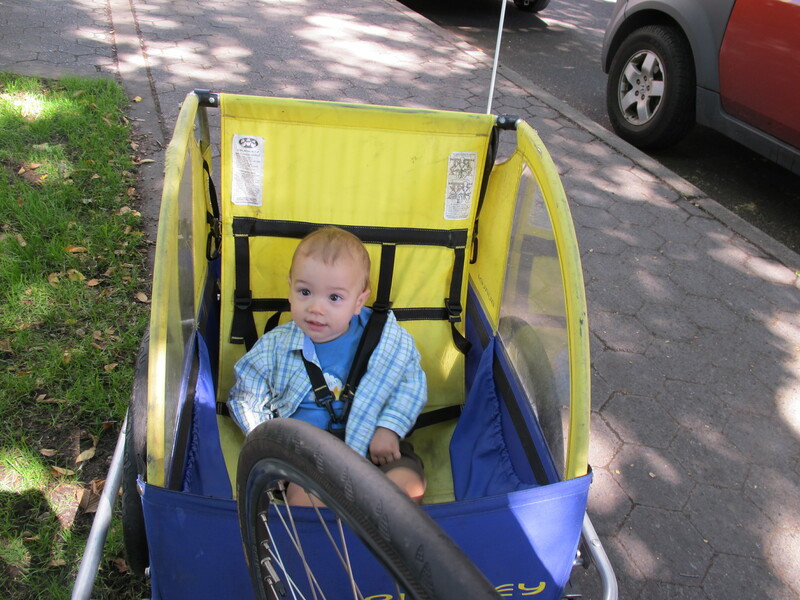 Our first ride was a short jaunt to a weekday downtown farmers’ market. We used the Broadway Bridge to cruise into downtown, noting that we’d be heading uphill on the return trip. After lunch at the market, we headed home for Gabriel’s nap. Unfortunately, as Matthew was shifting on the uphill approach to the bridge, his chain derailed. Hot midday sun, chain wedged tightly, tired and uncomfortable baby, stressed parents, and baby falling asleep in trailer and being rudely awakened combined for a not so great return trip and the decision to trade in the bikes for feet for the rest of that day. In the interest of maximizing our time and trying to keep to a fairly regular nap schedule (and because Matthew, especially, was uncomfortable on the bike), we compromised and made more trips in the car than I would have preferred, but such is life these days. On Saturday morning, Matthew and I enjoyed a solo bike ride to visit a couple of bakeries and make a grocery run in preparation for our trip to the Oregon coast. 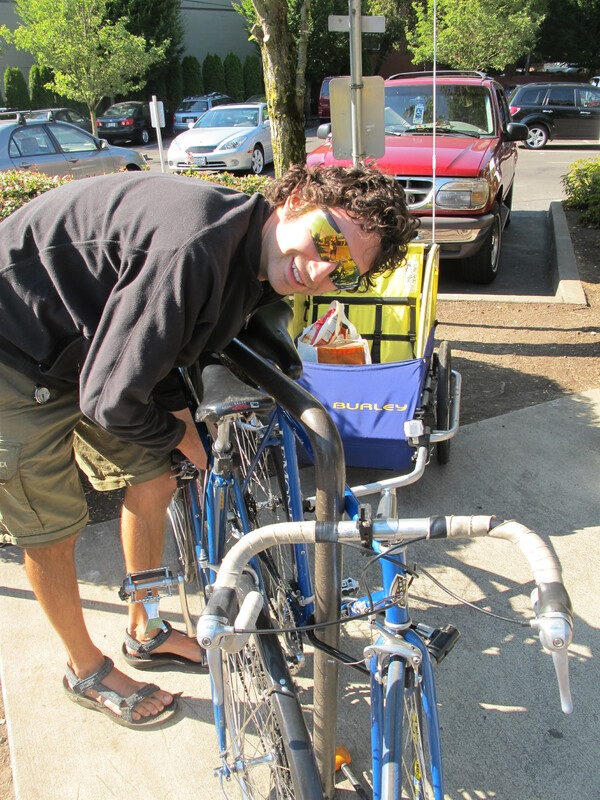 I enjoyed shopping at the Trader Joe’s located right in the middle of Portland – very accessible by bike. Well, I am pleased to report that I did not get ticketed or arrested for refusing to let the paint think for me (i.e., obey their mandatory bike lane statute) while cycling around the city. Going into the “Best Biking City in America,” the number of cars surprised (and disappointed) me. But after putting things into perspective (bikes make up a 6-8% mode share in Portland, which, while huge compared to most American cities, still means that less than one out of ten trips are made by bicycle) and settling in a bit, I did notice some differences. First, hanging out at the house in the evenings, we heard a slow but steady stream of cyclists passing by on the small street, something that does not happen on our similarly sized street at home in St. Louis. Second, most motorists seemed pretty tuned in to interactions with other road users (both cyclists and pedestrians). Most surprising to me were the multiple occasions where four lanes of traffic stopped at an intersection (when they didn’t have to, unless there’s some ordinance I’m not aware of) to allow bicyclists stopped at a stop sign on the smaller cross street to cross. Without this courtesy, we would have been waiting quite awhile for a break in the traffic. Most of these interactions happened at intersections on bikeways. In Portland, bikeways are regular streets (open to all types of vehicle traffic) that have just a few tweaks to make them better for bicycling – well-placed sharrows, 20MPH speed limits, and minimal stop signs. Some of the bikeways have low, broad speed bumps, designed to not be a big deal for bikes, while still serving as traffic calming for motor vehicles. The “bike accommodations” on the bridges were basically extra wide sidewalks. I felt pretty uncomfortable riding across the Broadway Bridge, with the relatively low height of the railing and my higher center of gravity on the bike. I wouldn’t have wanted to ride there in heavier bike traffic, because I felt a simple crash could send me plunging into the river far below. In such a situation, I would have been better off traveling in the normal traffic lanes (especially for the downhill trip), but I’m not sure what reception I would have received from other drivers (both car and bike) for not being where I was “supposed” to be. On that note, I did hear one person tell us to get on the sidewalk/bike lane as we approached the bridge that first day, right before the unfortunate chain incident, so even Portland has its ignorant and discourteous types. I also saw plenty of bicyclists who could use a good cycling education course, though I have to admit that figuring out the various types of bike facilities at the same time I was navigating a new city made my own actions a bit less predictable than ideal. We preferred the routes with “regular” streets or the bikeways to roads with bike lanes. When we found ourselves on the bike lane roads, we usually opted out of using them, or rode in them with EXTREME caution, mindful of the dangers of being in a less visible position. All in all, it was a good experience. Navigating a new city by any mode can be a bit intimidating, but I’d rather figure things out on a bike (or on foot) than in a car any day of the week. Gabriel did much better in the trailer than I expected, and we all enjoyed experiencing Portland by it’s most heralded (if still a minority) form of transportation. 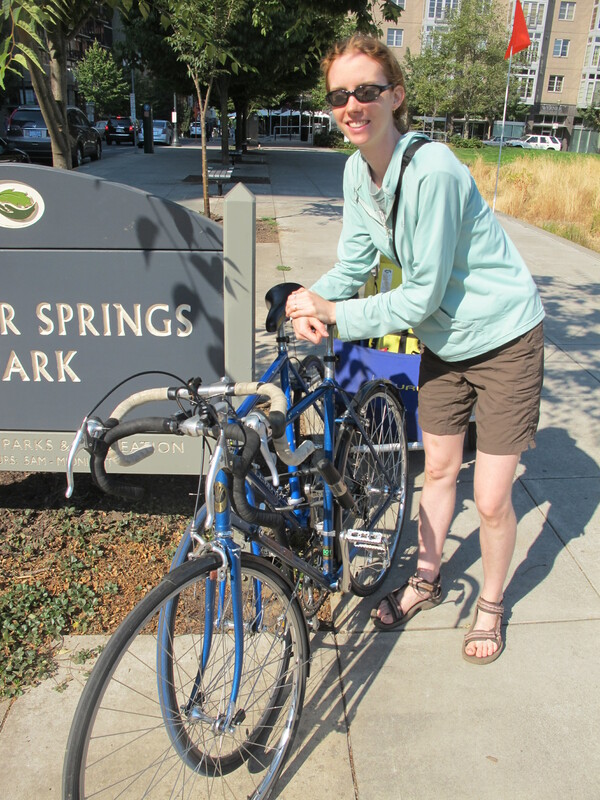 This entry was posted in Biking and tagged active living, biking with baby, Portland. Bookmark the permalink. I’m glad you got to enjoy a bit of Portland … it really is a lovely city. Though you are correct, like anywhere else, there are rude car drivers, as well as bad bike riders. Perhaps one day you and your family can come back in July when we have our bridge pedal. It’s a multiple mile event…near 15 – 20 thousand bikes! And the close down most of the bridges across the water (the Broadway too at times) … and for a lot of the bridges you get to ride where only cars normally are allowed. Music is played …and a great time. Hope your visit to the coast went well!